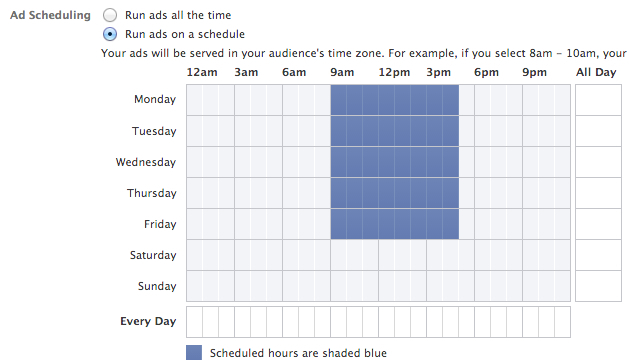 Facebook’s Ad Scheduling has been out for over a month now – and it’s wonderful. Here is a brief run down and a few suggestions on ways to use this feature. Ad scheduling allows you to start and stop campaigns at specific times, regardless of time zone. For example, an Ad Set scheduled to shut off at 7PM will continue to show in Los Angeles while it is no longer showing in New York. Family oriented ad campaign running 11AM-7PM. Adult-centric creative running from 8pm-3am. For the night enthusiasts, of course. Say you’re a B2B business and you sell industrial kitchen appliances. You’ll want to target business owners. While at work, people are more likely to check Facebook on their phones. Create a mobile campaign targeting small business owners between 9-5 or so to hit these targets. Scheduling is exclusive to Ad Sets, meaning you can have different campaigns for different types of the day. Use Google analytics to find your peak conversion time, and adjust as needed. Finally, scheduling is only available to lifetime budget campaigns. While a minor nuisance, you can always duplicate your campaign and re-adjust the start/stop date.